Los Angeles Kings forward Kyle Clifford is known for taking — and receiving — some of the most punishing checks in the NHL. He lists teammates Dustin Brown and Matt Greene among the hardest hitters in the game. Who are his hardest-hitting opponents? Vancouver Canucks forward Brad Richardson, formerly of the Colorado Avalanche, recommends John Elway's restaurant in suburban Denver. "It’s the best prime rib I’ve ever had," Richardson says. "Have it with the creamed corn." 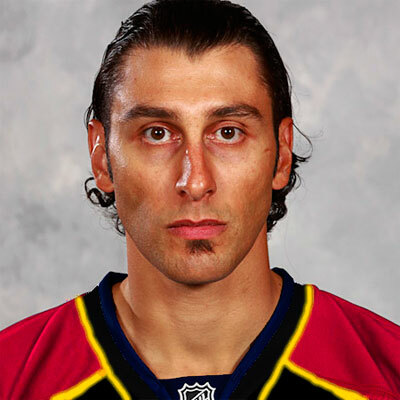 Roberto Luongo is the epitome of unpredictable. Sometimes he’ll post a shutout (Game 5 of 2011 Cup Finals), then follow with a three-goal, first-period horror show (Game 6 of 2011 Cup Finals). Sometimes he’ll get stoked for overtime – then miss the opening minutes because nature is calling. Sometimes he’ll say, “I always want to put the team ahead of me,” when, in actuality, he’s minutes away from requesting a trade, which happened in April when Los Angeles terminated his Vancouver Canucks’ playoff run. So we might not know how Roberto Luongo’s future will unfold. We do know this: When “Luongo” and “request” are mentioned in the same sentence, silly things happen. Oh, you remember his days in Florida, right? All those contract demands he made? Louie requested a “public statement” about a trade clause, backup goalie Jamie McLennan to be re-signed, and for Panthers management to fire their goalie coach and hire Luongo’s personal netminding aficionado Francois Allaire. Florida responded by shipping Louie to Vancouver – and the rest is history. So today, we eagerly await as the suitors align and the scapegoat prepares to gallop out of town. Luongo’s “how did that puck slip past me” gaze toward the rafters does not bode well in the United Center. His eyes fix upon Chicago’s mint condition 2010 Stanley Cup banner – salt in an open wound for Luongo, who is still insecure about his lost opportunity in 2011. He’s pulled four times in the opening five home games and conspiracy theorists begin to say Luongo is failing on purpose. Their conviction: When Luongo is pulled, all the cameras in the nation’s second largest media market catch the fresh looks of the Irish-Italian goalie. He sits on the bench with his mask off, his hair slicked back, perfect, not a strand out of place. It’s prime exposure for attention-grabbing marketers. The Backstreet Boys wonder if he’ll sing a duo with Howie. You know the “Luongo Look,” right? It’s the “who cares, I have a hot wife, Florida summer home, $50 million, and still will love life even if I just allowed four goals on eight shots” look. It causes the media to lambast Luongo in the papers and air waves. Through the scorn and ridicule, he quickly discovers that his favorite teammate is Marian Hossa. Their off-ice therapy sessions provide healing for a goaltender wronged by the public. Hossa, who endured similar wrath in many locations, explains that the “third time is the charm” and references failed opportunities in Pittsburgh and Detroit before striking gold in Chicago. Luongo, however, gets his signals crossed and demands a trade to Pittsburgh, but trade talks die when Luongo asks to bring “Wrigley Field” to replace PNC Park. The Blackhawks get swept by San Jose in the first round and Luongo blames Patrick Kane for shattering his confidence in practice. Luongo barks back and insists he’s “the next Johnny Bower,” the last Cup-winning goalie in Maple Leafs franchise history. Chalk it up as another ill-advised Luongo comment. The “four Cups” quote is blown out of proportion as the Toronto media compares it to LeBron James’ title quest. Hey, you can call Luongo conceited, corny or cocky – but he ain’t no dummy. He is well-versed, well-spoken and well-researched. His meta-tweeting is downright brilliant and he knows how to market himself. A big reason why he joined the Leafs? The Winter Classic. Not only to gain prime-time exposure, but to fully exploit his hatred for Boston, as cameras catch his pre-game lunch ritual with Phil Kessel. The Toronto Sun blows it out of proportion and features a melting “Mont Blanc” on its front page on the eve of the playoffs, a reference to Luongo’s poor playoff history. Under immense pressure, Luongo plays terribly in the opening round against New Jersey, but the Leafs stay alive and force Game 7. The series-ending game heads into double overtime, and Luongo tries the Johnny Bower patented poke check – except he whiffs on the puck and allows Ilya Kovalchuk to score the series winner. Luongo demands a trade to Philadelphia, but talks die when he requests the “CN Tower” to replace the Liberty Bell. Luongo endures a dose of self doubt and posts a career-worst 4.77 goals-against average at home. Not helping matters is the newly inserted $5 million HD screen above center ice. 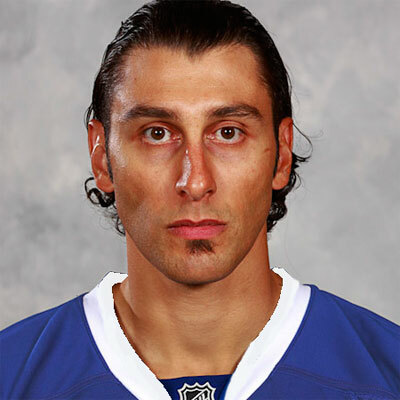 It plagues Luongo, who is often caught gazing at his replays. This makes it awfully difficult for him to follow the old goaltending adage, “forget about that last goal.” Really, how can you? They’re showed on a screen that rivals the Stay Puft Marshmallow Man in size. Luongo loses his voice and is restricted from post-game interviews in the opening round of the playoffs. Without the nagging questions, he relaxes and blows through Philadelphia in five games. Reality strikes in Round 2, when the vocal cords and media sessions return, thus marking an embarrassing four-game exit against Washington. Luongo demands a trade to Detroit but talks die when he requests to bring the “Gulf of Mexico” to replace the Detroit River. Luongo makes even more demands as he negotiates a deal to bring him back to Broward County. His list: A mandatory pregame chat with ex-Canuck Mikael Samuelsson, which involves releasing their emotions about Vancouver; a locker room dart board emblazoned with images of Patrick Kane and Tim Thomas; a tanning booth inside BankAtlantic Center for brother Fabio; weekly lunches with Miami Marlins manager Ozzie Guillen, who can share his experiences of being hated so quickly in a new town; post-game talks with Ed Jovanovski that involves complaining about their experiences in Vancouver; 100-by-40 foot rat above arena entrance with Luongo’s head on it and his No. 1 on the tail; a South Beach reality show starring himself and brother Fabio; the next major tropical storm to be named Hurricane Luongo. Luongo finally lands a deal and immediately feels right at home when he looks into the rafters and eyes the “1996 Stanley Cup Finalists” banner. Midway through the season, however, Luongo realizes he’ll never be as important as LeBron James, Dwyane Wade and the Miami Heat. The Panthers miss the playoffs and Luongo demands a trade to Minnesota. Talks die when he requests the “Everglades” to replace the Mall of America.